when she came back she told me she could help me! 1. I targeted a younger woman, 25-35, with an outgoing personality. I watched the check-in folks for about ten minutes before I made my move. 2. Time of day was around 12:30 pm. 3. I told her I was an old country boy from Juliette, Georgia who was trying to impress his wife. Told ’em I’d always stayed at lesser properties at the strip, but my wife had always wanted the Bellagio. Then I said the only thing that would make it even better would be a room with a nice view of the fountains. The clerk told me she’d go talk to her boss, when she came back she told me she could help me! Put the $20 between my license and the credit card – barely sticking out – handed it to her – didn’t let go when she reached for them – then I said “anything you can do to help make this stay memorable would be greatly appreciated” – 2 minutes later we had checked in almost 5 hours early to a beautiful room. Sent my wife in and she told them it was our anniversary. (it was close enough, haha). She typed for several minutes and then went in the back for a while. pretty much didn’t want to check in too early because of the sunday morning rush from everybody checking out. so we ate at the buffet and killed some time and then finally checked in. found a guy, because we figured we’d have better luck with a guy, had the 50 inbetween the cc and dl and just asked, would you happen to have any upgrades to suites available? he typed away, and said this is what i can do for you, found a nice mini-suite on the 25th floor with the lakeview and two windows views of everything to the right of bellagio. again, as everybody else says, well worth it in my opinion. 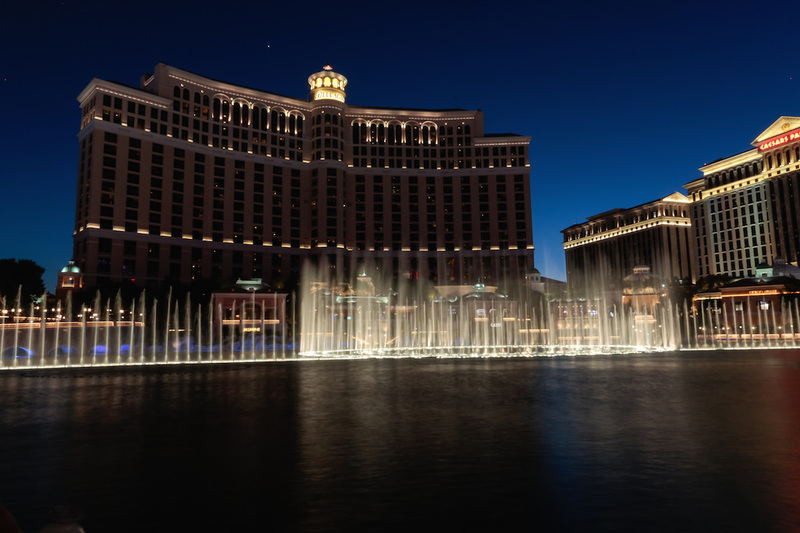 I never knew about this trick but when I stayed at the Bellagio for my Honeymoon, but I asked if we could be upgraded to a room over looking the fountains. The lady at the check in was very polite but said there was no rooms available but to check back tomorrow. We didn’t end up checking back the next day as the standard rooms are amazing to begin with but next time I will try the $20 trick to see what it gets me! Highly recommend Bellagio, amazing hotel! I was fortunate enough to find a room rate of $149/night for Thurs/Fri/Sat thanks to the Vegas hotel deals forum. At the front desk, I slipped $20 under my credit card and asked if any complimentary upgrades were available. I was hoping for a fountain view, but he upgraded us to a Tower Deluxe room. Basically, this meant a slightly larger room (625 vs. 510 sq ft) at the end of the hallway with windows on the north and west walls (including a third next to the bath tub with jacuzzi jets). We felt the upgrade was worth it. Booked a Bellagio Suite, husband folded a twenty between ID and Credit Card. Put it on the counter and the clerk saw it as Husband asked if there were any suites with a lakeview. He left the cards and bill on the counter and said he would look. Nothing. He went to the back to probably ask someone and was gone a few minutes. Came back and said no. All booked, supposedly. He took the card and ID, leaving the bill on the counter. He gave us a high floor with a nice view of the pool and mountains though. Just thought I’d throw in my experience for everyone. My wife and I were in Las Vegas last week. We stayed at the Bellagio (fantastic hotel!). Anyhow we got in on Wed. and left on Sat. We had booked our reservation as part of a package on Orbitz (I’m sure we were booked into the cheapest room they had). Put the $20 underneath my credit card and ask the for a view of the fountains. She put us up on the 28th floor right in the middle of the hotel looking down on the fountains. I know the tip worked as another couple went with us and booked the same trip (same price, flights, etc.) on Orbitz and checked in at the same time, and they ended up on the 12th floor facing the back of the hotel. Anyhow we had them up for a couple of bottles of wine a couple of nights and watched the fountain shows for a while before we went out. Fortunately, in Vegas you don’t need to be [a high roller]. You just need to tip the checkin clerk. And the best part is that you feel like Sinatra while you’re doing it. The conventional wisdom is that you’ll have more success with male clerks than females, but the dozen or so people working checkin were all women. I scoped out my choices and picked my line. I walked up to the front of the line when it was my turn, struck up a conversation, and pulled out my drivers license and credit card… with a $100 bill folded beneath it (with the amount clearly showing). In most properties a $20 should do the trick. At the Bellagio I’m guessing a $20 wouldn’t get me far, maybe the lakeview I was already in. Would a $50 have worked? Probably. But the $100 provides the wow ‘pop’ factor, and I really wanted a better room. Plus, I was planning to stay 4 nights so it’s really just an extra $25 a night (with no tax!). Chances hadn’t seemed good, since I checked online and the hotel was completely sold out. No rooms available for purchase, what if all the suites had been allocated? But I suppose they were probably oversold on standard rooms and someone was going to have to get moved up. I just figured I should make sure I secured that upgrade. The woman at checkin pounded at the keyboard and was having a terribly difficult time of it. It didn’t help that I was checking in at 1pm. Not all the rooms were cleaned yet, and she couldn’t assign a room that wasn’t ready even if I was willing to wait for it (and she couldn’t risk my coming back to get keys from another checkin clerk!). Finally she found a room that she promised I’d like. It was a two-bedroom, five bath suite in the Spa tower. Over two thousand square feet, my biggest suite score of the year (topping the 1650 square foot Diplomatic Suite at the Intercontinental Bangkok I had back in April). She handed me the keys, I pushed forward the $100, and she placed it in her pocket. Pleasure doing business with you! The whole transaction took place right under the nose of the assistant front desk manager, the checkin line I used was right next to the manager’s station. I really don’t know why clerks in Vegas regularly get away with this, perhaps it’s so ingrained in the culture that the cost to the hotel to monitor and disabuse the behavior is too high for it to be worth it. And perhaps wages for front desk clerks are depressed to account for their ability to supplement their income on their own. I can only speculate on the economics and motives of it. But someone is going to get moved up to a suite. In some circles it’s done by status. In others it’s random. In Vegas, tips are king — at checkin, at the show, everywhere. It’s culturally acceptable here, where in most other places it’s not. And I’m generally comfortable applying local ethos and customs and not binding myself by my own provincial norms. Sure, you could read “tip” as “bribe” — but it’s no secret to the hotels and I’ll defer to their judgment on the appropriateness of the technique. Mostly I wanted to see how well it would work. Thanks to Flyertalk’s skofarrell for plenty of tips on the technique. Here’s my previous post on the $20 trick and my other tips for scoring a hotel upgrade. I palmed clerk the money and him it was my honeymoon and I would like a suite. He was very friendly and gave us a gorgeous junior suite with a whirlpool bathtub for two with a view of the strip from the tub!! really nice and worth the tip. Four nights. Husband folded a twenty between card and ID and asked if there were any upgrades. Had booked a deluxe room (no view) and wanted a lakeview. Lady took the cards and money, slipped the bill into her pocket discreetly and quickly, then proceeded to check the system. No lakeview, but offered us a Salone Suite instead with a partial view of the strip. We said yes.